Specialized physical therapy services focusing on developing and enhancing the child’s gross motor and mobility skills for increased independent function. Our Physical Therapy team helps facilitate the development of gross motor milestones: sitting, crawling, standing, walking, running. 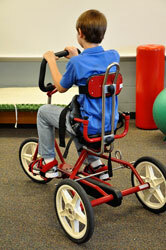 Our professionals have extensive training and expertise in the area of pediatric physical therapy. Copyright © 2018 Star Therapy & Sales Corporation.